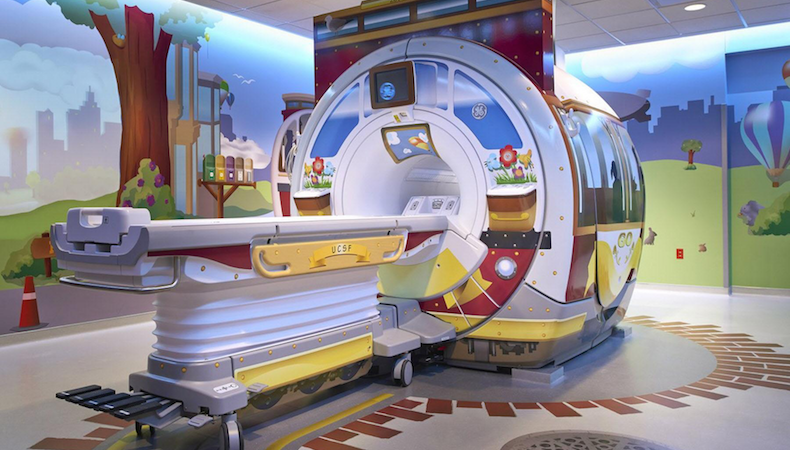 The sight of a terrified child about to have an MRI scan gave GE Healthcare industrial designer Doug Dietz a different perspective and led to a project that has turned imaging departments at 27 children's hospitals into small theme parks. The designs transformed a test into a voyage on a spaceship, a visit to a pirate island and other adventures. The imaging departments became elaborate sets and the techs became amateur actors with scripts. The series consists of a variety of themes for the different tests. For an MRI, it is a space voyage, with technicians telling children that the spaceship is about to go into hyper-drive when the machine becomes loud. For a PET scan, it is Camp Cozy, because children need to be calm and the test takes about 45 minutes. GE Healthcare also has developed themes for specific hospitals. For a children's hospital in San Francisco, for example, it designed a theme around cable cars. JWD-Creative, a Milwaukee ad agency, helped write the scripts and develop the artwork for the Adventure Series. The genesis of the idea for the Adventure Series came from Dietz's visiting a children's hospital to see an MRI machine that he had helped design. During the visit, he saw a terrified girl clinging to her parents before a scan. "It just broke my heart," Dietz said. "It was just an awful experience." Dietz realized that he and the other industrial designers in Waukesha needed to use their skills to improve the patient's experience during imaging tests. The technicians soon started getting into the role-playing, wearing scrubs that matched the theme and suggesting toys tied to the theme to give the children at the end of the scan. The project now is cited as a model of innovation. Dietz has given TED talks on creativity and been featured in a book by Tom and David Kelley of IDEO, an international design firm in Palo Alto, Calif.
"Children would cling to their mom's leg and start crying, and you would have to pry them off," said Kathleen Kapsin, radiology director of Children's Hospital of Pittsburgh, part of the University of Pittsburgh Medical Center. "Now they walk in and they are excited." GE Healthcare estimates that the Adventure Series costs $50,000 to $100,000 for each "room" with imaging equipment.